Waking up at a five star gravel pit was awesome. The view was fantastic, the sun was shining. Last night, we left the array set up anticipating the early sunrise, it paid off, by the time we were up from our sleeping comatose the battery was already seating at 97V. Hurray!!! Hey, that is half full. Cereal for breakfast, checked the batteries voltage, not bad, a light top up of two low cells and we were on the way to Dawson. Anne and Claire paired up in Anne's car. Claire (A.K.A. Laura Croft) hanging out the window, climbing on the roof of Anne's Car While Anne herself also climb some hills to capture all the action from different angles. Way to go girls! The drive was very enjoyable, more gravel sections and detours full of potholes to spice up the driving and get some great shots. Made a quick stop at the Dempster Lodge to say hi to Richard, who last year tried at all cost to persuade me not to drive on the Dempster. He warned me about the road being at its worst since it was built 40 years ago, muddy, potholes, rockslides, etc...even told me about motorcyclist being med vac after his front wheel got stuck on the mud sending him flying. -"You won't make it, look at your skinny tires" he said. On the way back, I stopped by to say hi, he was in disbelieve :). Unfortunately, Richard is took three months off, I won't be seeing him this time. Near Dawson, made another stop to visit some of the people I met last year. At last, a trip back to the past. We arrived in Dawson City! great to be back. A short drive downtown, stop at Triple J, nice to see Brad and other hotel staff, they have been anticipating our arrival. Hello everyone! We got the array set up, battery charging. 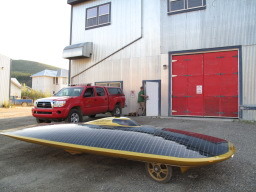 Anne took on the initiative to contact the Fire Hall to park the solar car for the night. Thanks Anne! Got new pair of sunglasses from Anne. Now Willy can stop making fun of my "not so cool shades". Thanks Anne! Thanks Triple J for your hospitality! Just into Dawson, past the small airport and scattered log houses in the hay field, we stop near a gold mine at an auto shop. Marcelo is familiar with the owners and he thinks maybe they will sponsor us with gas for the van. We feast on ice cream on the porch of the small blue building and learn the origin of yesterday’s fire spreading over Carmax and Fiver Finger Rapids from the owner, Blair. A man and his lady got into a fight and after she kicked him out he walked and walked and started a fire to keep warm at night in the woods. He continued on without properly putting out the fire and with the season being so dry and hot, the fire spread and grew into what prevented us from moving forward, smoke filling the sky for over 200 km. Costing $50k to put out the fire after it spread, the town is placing the fine on the fire starter, picked up on the side of the road hitching in the middle of nowhere, no car, no bags, just drunk and admitting to abandoning a fire. Blair also tells us the Dempster Highway is in the best condition it’s been for the past ten years. Add that to the sunny weather and clear skies and we should make it ideally in half the time it took from Dawson City to Inuvik last year. Downtown Dawson looks like a movie set from an old western: the thin double and triple story wooden buildings, dirt roads and raised wooden sidewalks and buildings that have been standing for almost a century speak of a bustling history of generations. Today instead of cowboys and frilly dressed ladies are weathered locals, long haired backpackers and trendy young kids here for the festival, drawn to the wild unpaved and unending sunshine of the Yukon. With all the golden light that shines well into the next morning, it’s no wonder there was so much gold buried within these mountains. After arranging a room at the Triple J, we eagerly log onto the internet and take turns watching the solar car charging in the parking lot. Josh, Anne and I each enjoy a smooth glass of potable spirits and soon we are all outside about to begin the solar car procession to the fire house. With the camera mounted to film us all marching behind the solar car through the dusty Dawson City, we take to the streets. Josh has his ukulele in hand and provides the soundtrack for our parade, as if the solar car didn’t attract enough attention, I can officially say that this scene is indicative of the gypsy circus that is the solar car crew. Willy, Claire, Anne, Charlotte (Happy Birthday! ), Josh and myself all accompany the stellar cruiser through the crowd outside the Palace Grand Theater and into the firehouse just past Duke Street. With the solar car safely tucked in behind a fire truck, the night is ours. Starving, the six of us scour the town for an open restaurant, but the sun still high in the sky gives the illusion of a dinner hour when it’s now past 11pm. The kitchens are all closed but the fine family establishment of Diamond Tooth Gertie’s Gambling Hall is still cooking. This casino is a thrilling step back in time, with live ragtime entertainment, dancers and an upstairs balcony. The wheels spin, the cards are feverishly dealt and the seven’s spin rapidly and unluckily. We order from the bar and enjoy Yukon gold, liquified and fermented, aaah! After our much needed hot and tasty meal, Josh jumps on the piano and commences to fill the noisy casino with the sounds of the Maple Leaf Rag between onstage acts. A few hands of blackjack that don’t pan out and we head out to The Pit for dancing and imbibery! A faded pink building, the entrance hovering with locals outside smoking, inside there is not an empty seat and the band is well appreciated by every drink filled customer. Several couples swing and dance up front and a drunken man uses the railing as a partner. This same man tells us outside about his magical Inuit lady and asks the circling RCMP officers for a ride. “To jail.” they say. We’re waiting for Marcelo and Anne to return in warmer wear when Josh runs off and returns with news. “I’ve got a gig at the Midnight Sun Hotel in 20 minutes to an hour.” In preparation for his act he runs a lap around the block and soon we are inside what the locals call The Scum, The Midnight Sun Hotel, with Josh on the piano playing a request from the crowd: Piano Man. A round of Canadians and the whole joint is singing along. A round of Patron from our newly found oil rig paramedic friend, Brett, and we are taking shaky photos, hugging and dancing to Josh playing Queen. A fiver is laid on top of the piano for Josh, now a real Canadian Busker. For the last song I am up and reeled in by a gentleman across the room, dancing and pouring song into the ears of those inside the Midnight Sun, and outside as well, for the ones under the glow of the 1am sun. Bottles cover our tables and outside the chill is numbed by the drinks. Josh continues his musical conquering of Dawson with a ukulele jam on the porch. The sun still illuminating the streets, we split up to finish the night. Marcelo to bed, Willy and Claire to the hostel and Josh, Anne and I to the nearest mountain for a short hike and pow wow. Josh flies down the mountain and is already two blocks ahead of us, but Anne finds a sweet pair of sunglasses and I purr with a passing black cat before catching up to him. 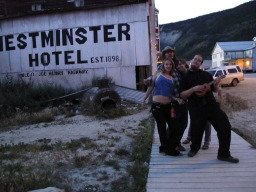 Inside the hotel room, the four of us squeeze into the two single beds and in the constant summer light of the night end our Dawson City night with laughs. It took us a little while to finally get going this morning, but when we did, it was clear skies and a nicely charged battery that would carry us into Dawson City. We got some great shots along the way of scenery, wood piles, and wildlife. Claire rode with Anne today to take photos. The crew made it to beautiful Dawson City in late afternoon. Marcelo was able to secure a small room at the Triple J downtown. The gorgeous Klondike River shone under the sunshine as we drove through town. After getting settled in our rooms, Marcelo found a great place to keep the solar car for the night. We contacted the local fire station to see if they would keep the Xof1 overnight. Marcelo obtained permission to park the car, and we decided to walk behind the solar car to the fire station, since it was so close by. I grabbed my ukulele, and gave Willy the video camera. Claire and Anne took pictures while Marcelo drove with the camera facing behind him. 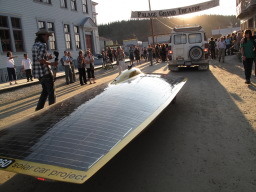 Thus began the Power of One Solar Car Parade in Dawson City, 2009. 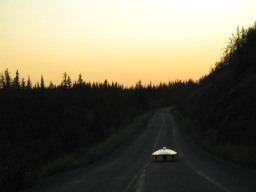 Walking behind Marcelo, I took a deep breath and began singing and playing an improvised and contextual “Solar Car Blues.” We walked by the “Palace Grand Theater”, where crowds stood in awe at the solar car. Pulling into the fire house, we were still elated from the walk over, and went out to get something to eat. Most places were closed by now, so we went over to Diamond Tooth Gerties for some food and fun. I shared a vegetable lasagna with Laura, and had some Yukon brew. After a little food, I asked the casino manager if I could play some tunes on the piano. I played a Maple Leaf Rag, and a song by Liszt. The casino manager didn't want to turn off the music between shows, and so I complied. The shows at Diamond Tooth Gertie's are pretty spectacular. From the choreographed can-can dancers to the live music, we had a blast. I thought about playing a round of Blackjack, but declined when they asked me to exchange my American money for Canadian money. Moving on downtown, Marcelo said he would be going back to the hotel, and so I went looking for another piano. I checked at a bar called the Midnight Sun. I asked the owner, Nancy, if she would let me play a few songs after the piano player had finished for the night. She agreed to let me audition for the time on the piano. I told everyone on the team, who was hearing some live music at the Pit, to come hear my gig. Everyone came over to the Midnight Sun, where I was eagerly waiting to play on a nice piano. I had a few requests shouted at me from a table behind. I didn't know the first two songs they requested, but I did know the third. I heard the words “piano man,” and without hesitation I jumped into singing one of my favorite songs to play. I sang loud, and enjoyed myself, and everyone sang along. I got a standing ovation, and was happy to be brightening the mood in the already bright Dawson City. Even though the Midnight Sun was had a bright midnight sun shining outside, some people were getting to bed a bit earlier than we were. I played a “We Are the Champions” followed up by a “Bohemian Rhapsody.” I had to concentrate when finishing up the last song, as they were closing up shop. A guy ordered shots for our table. We talked with him for a while, and then Laura, Anne and I went for a walk while the others remained behind. My night ended with Laura and I seeing a hilarious episode of Family Guy. I got some sleep as soon as possible because I knew we were heading out towards Inuvik first thing tomorrow. We all got up around 9:30am and started on small jobs. The morning had a significant downer with an elementary diagnosis of serious damage done to Marcelo's SLR. It was either due to the limited life of the battery or an more severe internal issue. Marcelo was understandably disappointed by this and the practices that brought it to this point. My camera is the only possession I would cry and maybe punch something over, so I offered my accountability, condolences, and assistance to the disheartening obstacle. We need a sponsor, it's hard for him to do it all on his own. We left around 2pm and took cool footage as the car zoomed past the skirting fireweed and towering piles of dead wood. I jumped in the car with Anne to learn about another person crazy enough to join the tour and to also get some different angle shots. "Do you mind if I hang out your window?" I say as I take my seat. No worries! We jumped ahead of the van and car and took pictures of our humble solar parade, as opposed to the beautiful, but abundant shots of the car sans support van. We drove ahead and stopped at the start of a construction site with a dirt detour lane and orange poles and signs scattered about. I climbed on top of her car and played with the angles before the car came. In our time waiting, a young coyote came out from the bush and walked along the detour path without regard. I all but freaked out from excitement. I hadn't ever seen one and I was giddy at its presence. It strolled all around the area and I hoped to recreate the photo of the solar car with the wolf taken last year. He was spooked by other cars before the Marcelo came through, but I mentally photoshopped him into the frame for my own enjoyment. It was really nice to drive with Anne. We got to talk about non-solar subjects and have a few laughs. As expected, and very much welcomed, Willy's antics stayed with us via radio. He supplemented the gorgeous landscape with stories about mice, pilot announcements, and other quality bone dry humor. During the quiet moments I relaxed back into the seat and thought 'this is what a road trip would feel like.' I wouldn't trade the solar tour experience for anything, but it was nice to look around and not have a 'job' to do, only to sit and move along. 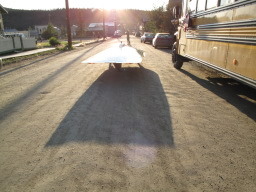 We arrived in Dawson City around 6:30pm, 100.2 miles from Stewarts Crossing. With a relationship with Xof1 from last year, the Triple J Hotel sponsored us a room for the night, THANK YOU! All I could think about was jumping into the shower. I appreciated the sentimental roughness my feet displayed, but the ball dred developing from my ponytail had to go. I was getting to the point where I smelled myself, and that's shower time. Before that dream of clean could come true, the solar squad was kind enough to dismiss me so I could walk with Willy to set up his accomodation for the next week. We took the ferry across the brown Yukon River to the youth hostel he stayed at the year before. There is no electricity or running water and that's part of it's perfection. There is a shed where you can chop up wood to heat up the shower furnace, stove, or fireplace and a quiet wooden den walled with books for some read and relaxation. Deter, the hostel manager, had the lengthy talk of a well-lived, worldly man, a fact further evidenced by his pictures draping every vertical surface in the room. My desire for soapy water was again rightfully postponed to do some solar babysitting and to work on my updates a bit. One guy came up and told me that he was very proud that we were doing this. A stranger's spoken appreciation is such a refreshing gift. Those comments zap my mind to the macro level of this mission, a comforting realization after being so focused on the smaller, daily impacts of the tour. Thank you for saying thank you, Sir. Around 9pm, we put down the array and Marcelo notified us that we would be making a parade out of transporting the car to the local firehouse where it would stay overnight. We put the video camera on the top of the car facing backwards and we walked behind the car. I mostly ran around taking pictures, Josh belted out improve lyrics over the ukulele, and Laura, Willy, Anne, and Charlotte laughed and zigzaged behind the car. We made quite a scene and had a lot of fun with it. It was 10:30pm and we were HUNGRY, but even though it looks like four in the afternoon, places still close! We found ourselves getting dinner at the Casino, sharing a round of cold Yukon beer between slot machines, ATMs, and showgirls. After that we headed to Westminister Hotel, or "The Pit," but we were a little disappointed that the music selection wasn't encouraging our dancing shoes. It was so strange to be standing outside a thumping bar when it is so bright out. It felt like a lunch break gone wild. Next thing I know, Josh tells us that he just got a gig playing piano at the Midnight Sun Hotel. With his head a little, er, cloudy, he does a run around he block and is then ready to rock. HE WAS A HIT! Within the first song he got a $5 tip. We were all swaying, hooting, and singing, supporting our musically inclined solar brother. GREAT SHOW JOSH! The now-normal morning bedtime hour came along and I was eager to go to bed. Dawson City showed us a good time, but not good enough to ease the fact that Willy would not go any further with us. What might be the last night of all six of us together was a good one and I will remember it forever. (Still no shower). we woke up in the gravel pit to a gloriously sunny day. we ate cereal for breakfast, claire and i did some yoga. we had a nice drive to dawson. there were more construction sections and one where the chipper crew was laying down oil. it made me think about road infrastructure and transportation/driving. claire rode with me and contorted her body to hang out the car window to take photos. she's a great photographer and a very proactive and valuable member of the solar car tour. she is mature and responsible for someone so young. i admire her independence and courage and she's got a huge beautiful smile and laughs a lot. after cruising down the recently oiled front street in dawson city, we stopped at triple is and i learned how to set up the array. 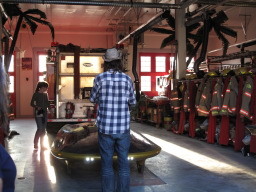 i called the fire chief and we arranged to park the solar car at the firehall. we had a walking procession/parade with the solar car to the fire hall. we passed by a huge crowd outside the palace grand theatre of people who were milling about after the Persuasions concert. the support team followed the solar car and josh serenaded us for the procession with his ukulele... solar car blues! my tagish/highways pal charlotte joined us but she was a little delicate as it was her birthday the day before and had celebrated dawson style. so the solar car crew went out on the town to eat and drink. we ate at diamond tooth gerties and josh played the piano... later at the midnight sun josh had another impromptu gig and had a receptive and appreciative crowd. he played the piano man, we are the champions, and bohemian rhapsody until the midnight sun hotel guests complained about the noise so we had to be quiet. laura josh and i had a slightly tipsy drunken walk and i found some polarized sunglasses on the road which i gave to marcelo. Checking the battery levels first thing in the morning. The multi meter says, "Batteries are level!" Making sure the batteries are leveled out ensures efficiency. 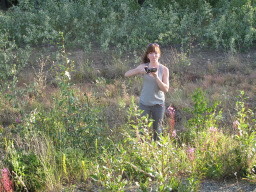 Claire takes some shots from among the wild flowers. 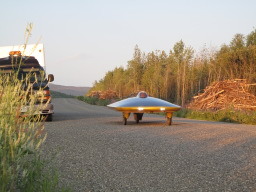 The solar car zipping to Dawson City. Piles of wood scattered all over the road end up getting burned. That morning sun shines on the Xof1. 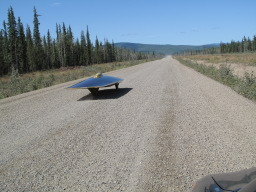 Gravel roads greet the solar car. Apparently these wood piles get burned all at once. At the peak of the road...where will it go? And they go on for miles. The gravel is quite challenging for the solar car tires. Getting past the road blocks. Doing the slalom with barricades. 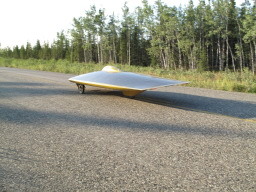 The support vehicle chasing the solar car. Zoom out to the road. Zoom in on the action. A lovely lake in the mountains. It's a solar emergency! We need a pilot car to take us by the freshly oiled roads. 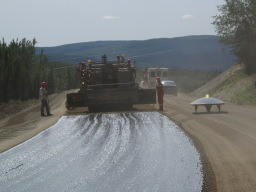 The Alaskan Highway is constantly being repaired. Some more beautiful scenery to caress our gaze. Josh preparing the camera for placement. Trying to block the sun from his eyes. A gold mine that donated us some gas. Laura looking towards the future. Greg was a great guy. Thanks for all the help! These guys have had a long day at work. Crossing over that bridge into Dawson City. Anne helping with the array. Anne learning the ropes and rods of solar car charging. The support team working some support rods. Working at the car wash. The whole gang, without Willy Wanka. Alright that's enough, Anne wants to fly now. Willy Wanka saying hi to the solar car. 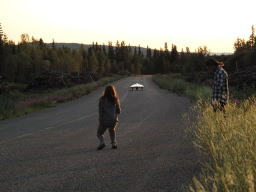 "Whoa, a UFO, right here in Dawson City!" Snap a photo! It's the Solar Car! 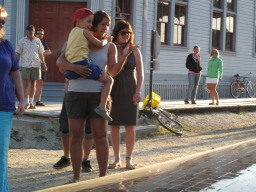 The 2009 Dawson City Xof1 Parade. A sunny day to roll through the city. See the shine on that solar car? That's what the future looks like. Stop what you're doing, solar power is inspiring the Yukon. Singin' the solar car blues. Palace Grand Theater has a huge draw around the solar car. Everyone see the solar car spaceship. Dawson City fire trucks. Thank you Dawson City fire fighters for letting us stay! Back it on in boys! Off into the night, or day? A masonic lodge in Dawson City. Getting some food at Diamond Tooth Gertie's Casino. Cheers, with Yukon Gold Brew! Josh plays a gig at the Midnight Sun! 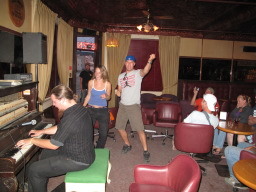 Laura dancing and jiving while Josh jams on the Bohemian Rhapsody.